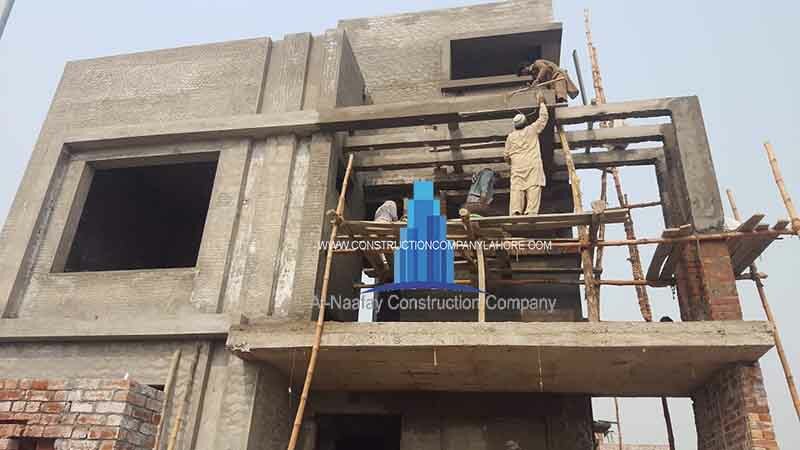 Grey structure means all structure with plastering, concrete P.C.C flooring, complete sanitary and sewerage, water piping, gas piping works except for bathroom fixtures, and only conduit piping for electricity. A house with a grey structure built with best quality materials and construction standards; flooring in imported tiles with max. A range of Rs.2500-3000/sqm; imported tiles in baths with max. a range of Rs.3000/sqm; doors in solid ash woodwork; cupboards and kitchens by Euro/Aran/Berloni; Grohe fixtures and Imported pots in baths; false ceiling in Plaster of Paris on 100% of covered area; Media and feature walls; and paintwork with ICI/DIAMOND, Berger, Black Horse paints. A house with a grey structure built with best quality materials and construction standards; flooring in imported tiles with max. a range of Rs.1800/sqm; imported tiles in baths with max. a range of Rs.2200/sqm; semi-solid ash wood doors work; cupboards and kitchens in UV sheets; Grohe fixtures and Porta pots in baths; false ceiling in Plaster of Paris on 70% of covered area; and paintwork with ICI/Diamond paint. A house with a grey structure built with best quality materials and construction standards; flooring in imported tiles with max. a range of Rs.1600/sqm; imported tiles in baths with max. a range of Rs.1600/sqm; ply flushed doors; cupboards and kitchens in local lamination; Sonex fixtures and Porta pots in baths; false ceiling in Plaster of Paris on 25% of covered area; and paintwork with ICI/Diamond paints. Note: Above rates were evaluated in March 2019 and valid for the next Three months only.